High school is hypnotic. It ticks and tocks, drawing us into a world we know all too well. From memories, dreams, and most of all, from the movies. What if all those American teen movies from the ’90s and early 2000s took place in the same universe? What if Crash Override and Cher Horowitz and Laura Palmer all went to the same high school? In the cleverly cut opening to director Charlie Lyne’s essay film Beyond Clueless, their worlds are brought together in one long hallway of jeers and sneers, smug smiles, and adolescent longing. Made entirely of clips, Beyond Clueless does with editing for film what the album Endtroducing… did with sampling for music. Shepherded by the voice of Fairuza Balk, the film is a bricolage of footage meticulously collected from over 200 films, weaving together an era of cliques and hierarchies, baggy pants and chokers, beepers and laptops, with a dash of apple pie and occultism. For the title sequence, Charlie Lyne splices these teenage hells into one world and unites them with the help of composing team Summer Camp (Jeremy Warmsley and Elizabeth Sankey) and illustrator Hattie Stewart. Summer Camp’s theme is light and dynamic, finely straddling that space between nostalgic shoegaze and modern pop, while Stewart’s small but energetic white scrawls plant the sequence firmly in its world. A conversation with director CHARLIE LYNE and illustrator HATTIE STEWART. So, Charlie. Warm us up with a little background on yourself. How did you start out in film, and how did you get here? Charlie: I started a movie blog called Ultra Culture when I was 16, and through that I slowly managed to get freelance work as a film critic. Now I write a weekly column for The Guardian and also write for Sight & Sound, Little White Lies, and a few other outlets, though most of my time is now taken up with filmmaking. I'm making another essay film for the BBC at the moment – this time about fear and horror movies – and that's set to premiere in October. Hattie, you describe yourself as a “professional doodler” – what does that entail? 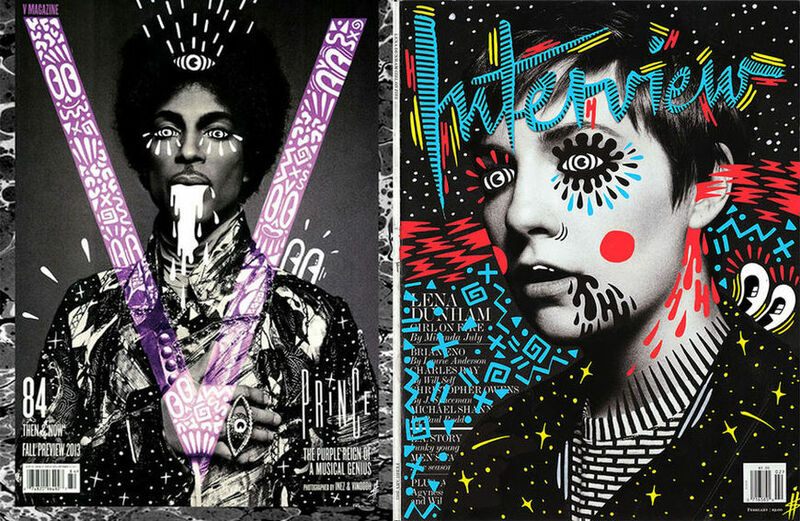 Hattie: I'm an illustrator based in London and I create work in many creative realms including animation, photography, and fashion. 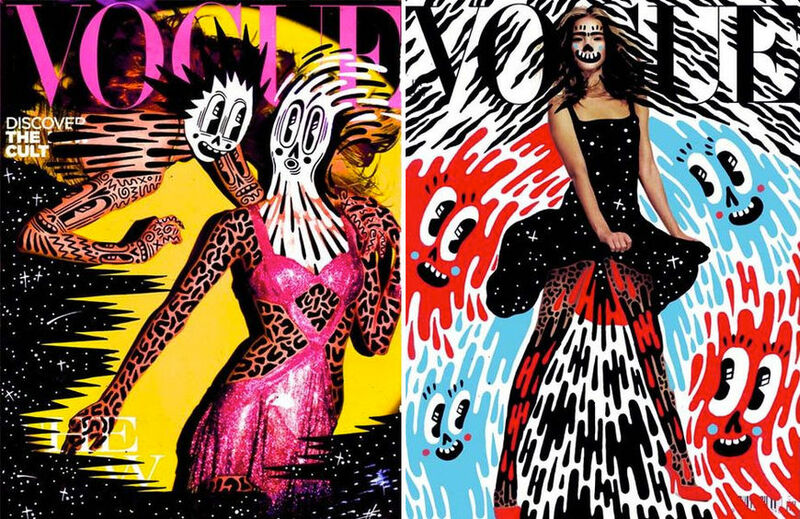 I have a heavily character-based style and I'm probably best known for my 'doodle bomb' series where I draw over famous magazine covers with a homage-meets-satire approach. Watching the film I was struck by just how many of these teen movies I’d seen – or rather, forgotten I’d seen. It was a prolific time for this genre and it all sort of blends together in your head! Had you seen most of these films before embarking on the project or was it a bit of a process of discovery for you? Charlie: I spent a lot of my time watching these films as a teenager, so making Beyond Clueless was really a process of rediscovery. For about three months, I did pretty much nothing but watch teen movies, and like you say, before long they all started to blend into one another. To be honest though, that was exactly the point. I wasn't really interested in the merits of individual teen movies, but instead the strange, hallucinatory universe that they all seem to share. So I welcomed those moments when the lines between each film started to blur. What was it about the teen movie – specifically ’90s teen movies – that made you decide to make it the subject of your first feature length film? Charlie: I've been watching teen movies – and therefore inadvertently researching Beyond Clueless – since I was about 13, but it was only when I entered adulthood that I began to see them in a new light. I found that my emotional attachment to films like The Craft, Cruel Intentions, and EuroTrip was as intense as ever, but at the same time I could finally see aspects of those films that had completely passed me by as an adolescent. It was that bittersweet feeling – halfway between nostalgia and unease – that I wanted to distill, so I set out to make a film that could double as a critique of teen movies and a teen movie in its own right. The best teen movies reflect the lives of contemporary teenagers, so they’re inevitably products of their time. Tell me about the genesis of the “corridor walk” montage as the introduction to the teen movie universe you construct. You describe the title sequence in your script as “big, boisterous, gauntlet-throwing.” Why did that particular teen movie trope scream “title sequence” to you? Charlie: The corridor walk is like the Elizabethan prologue of the teen movie, introducing each of the key players with an incredible degree of emblematic precision. Right, there’s a certain iconography to it that you don’t fully realize until you see them all together. Charlie: I love the way that the tiniest of glances can tell you everything you need to know about a character. More important, it seemed like the perfect way to introduce people to the idea that they were entering a kind of unified cinematic world, inhabited by thousands of characters from hundreds of different films. The aesthetic of the corridor walk is very consistent from film to film so it lends itself well to montage. It helps that most of them are shot in the same five or six California high schools! How did the mood board come together? How did you choose the clips? Charlie: The composers, Elizabeth Sankey and Jeremy Warmsley of Summer Camp and I developed a kind of back-and-forth approach to collaboration, so we'd each take a section of the film, spend a few days on it, and then trade. For the title sequence, I wanted to give them a sense of tone without restricting them to a certain length or tempo by doing a proper rough cut, so I cut together a fairly freeform mood board instead. I had a library of over 300 teen movies digitised by that point, so it was easy enough to lift out all the clips. It's such a recurring trope that the mood board could easily have been twice as long, but I tried to prioritise the shots that felt visually consistent. Beyond Clueless title sequence mood board. Music has always been an integral part of the teen movie, so naturally it’s an important part of your film as well. How did Summer Camp become involved initially? Their score is fantastic. Charlie: At the time I began thinking about Beyond Clueless, Summer Camp’s music was basically the soundtrack to my life. I was obsessed. I loved how their first album Welcome to Condale conjured up a whole world in a matter of minutes, and then spent the rest of its duration picking apart that world from within. That's exactly what I wanted to achieve with the film, so I wrote a rambly proposal and sent it their way. They're as fascinated by the teen genre as I am – two of their songs are called “Brian Krakow” and “Veronica Sawyer” – so it was a no-brainer. Brian Krakow and Veronica Sawyer are characters from the television series My So-Called Life and the film Heathers, respectively. So you briefed Elizabeth and Jeremy, requesting a “big pop onslaught” with lyrics for the opening titles, and provided them with your mood board assembly. What did they come back to you with? Charlie: I remember them being quite secretive when it came to this track. I knew that it was coming, but they didn't reveal any details until a demo arrived in my inbox pretty much fully-formed. And I think that was the first moment that the whole project went from feeling like a weird bedroom art project to a bona fide film. I'm a firm believer in the power of a strong title track, and the thought of having one as good as what they came up with at the front of Beyond Clueless totally changed the way I saw the film. Better yet, I lived with it for several weeks before I even began to pick apart the lyrics, which was a whole other revelation. Summer Camp - "Beyond Clueless"
You use hundreds of clips from countless films in the documentary. What was the process of finding all those films and clips like? Charlie: I'm a total pedant when it comes to video quality, so I have great respect for anyone – Art of the Title included – who goes out of their way to get the best version of a given film available, even when a standard DVD rip would probably suffice. With that in mind, I did a lot of importing: 200 Cigarettes from Italy, The Virgin Suicides from France, The Dreamers from a Cyrillic-script Russian website – it showed up two months later in a crate! Inevitably a few films weren't available in high definition. The clips I took from Masterminds and Girls Town are transferred from VHS, but more and more became available as we went along. Even The Rage: Carrie 2 is on Blu-ray now. At what point in the Beyond Clueless process did you come aboard, Hattie? Did you and Charlie already know each other? Hattie: Yes! Charlie had not long ago received one of my Mean Girls screenprints from Print Club London and it was hanging in his office. He told me he looked at it and then thought of me to come on board to work on the opening title sequence, which, little did he know, had always been a dream of mine! Charlie: I'd been racking my brain for months trying to think of the right person to do the titles for the film before I looked up and realised that the answer was literally hanging above my head. A friend had given me Hattie's doodle-bombed Mean Girls poster as a birthday present and I had it displayed directly above the computer I was editing Beyond Clueless on. It dawned on me that what Hattie was doing with illustration was an exact analogue of what we were attempting with the film: taking existing pieces of pop culture and adding a layer of commentary to both celebrate and deconstruct the original work. What were your conversations about the typography and title cards like? Did you have a clear idea of what you wanted? Charlie: I knew that a film built from as many constituent parts as Beyond Clueless could easily wind up feeling scattershot, so I was keen that Hattie's titles should – like Summer Camp's score – act as a unifying force. Hattie had a bunch of ideas, including creating a standalone typeface for the various movie titles dotted throughout the film. 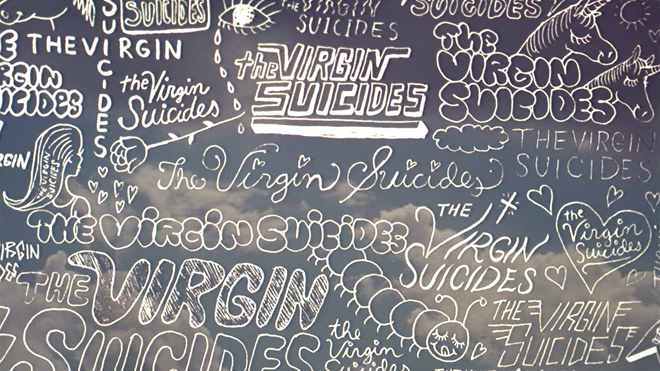 For the title sequence itself, we talked about emulating the feel of teenage scrapbooks and diaries, a bit like the opening of The Virgin Suicides, but using the effect sparingly, to hint at the mechanics of the genre. Hattie: We were both actually on the same page and the opening titles of The Virgin Suicides was the inspiration for the Beyond Clueless titles. Also for me the opening sequence of Almost Famous where it's all written in pencil. We wanted the typography to not be too clean and have the aesthetic of a teen writing in the back of their notebook. When it came to animating the titles I wanted them to look imperfect and frantic, like it's bursting with pent up teen energy, angst, or sexual frustration – rebellious scrawlings on school lockers coming to life. Image Set: Original and unused title design and credit lettering by Hattie Stewart. Was this new to you or had you created animated type like this before? Hattie: Yes, I had actually. I worked closely with the awesome animator Andy Baker on some type-based projects and he knew exactly what I wanted for this sequence so it was a really straightforward process. So what was the process like? Hattie: We met up to chat and I think we totally understood each other from the get go – he knew what he wanted and luckily I was thinking the same! When it came to designing the type I pretty much had free rein and I think this is because he was already aware of my work and style beforehand so he knew what to expect! There were a few changes here or there but working with Charlie was a pleasure. It's always fun to be on a project with a director who is passionate about his vision and work but totally respects your own and makes everyone a part of it. Which tools and software did you use to create and animate the type? Hattie: All the type and individual elements were hand-drawn, then scanned and edited in Photoshop and the animation was created in Flash. Let’s talk about the editing process a bit, Charlie. Did you already have the cut roughly assembled based on your mood board or did you cut it to Summer Camp’s title track? Charlie: As with most of the musically inclined sequences in the film, I let Summer Camp take the lead as much as possible. So once I had their demo, I cut a rough version of the sequence and sent it back to them so they could make tweaks in response to my work – for instance, adding a guitar flourish over a particularly dynamic camera movement. We went back and forth like this half a dozen times and eventually wound up with something we were both happy with. Unlike longform writing, the video essay and the essay film seem to be enjoying a kind of renaissance at the moment, with films like Beyond Clueless and Room 237 and popular YouTube channels like Every Frame a Painting. Why do you think that is? Charlie: Essay films are obviously nothing new, but where they were once reserved for filmmakers with access to extensive archives and high-end editing suites, I think they've come to represent a kind of democratic idyll in modern cinema. Anyone with a couple of DVDs and a laptop can make a film like Beyond Clueless, and people are – in the thousands. The only reason cinemas and festivals aren't overrun is that the vast majority of them aren't thought of as 'films'. 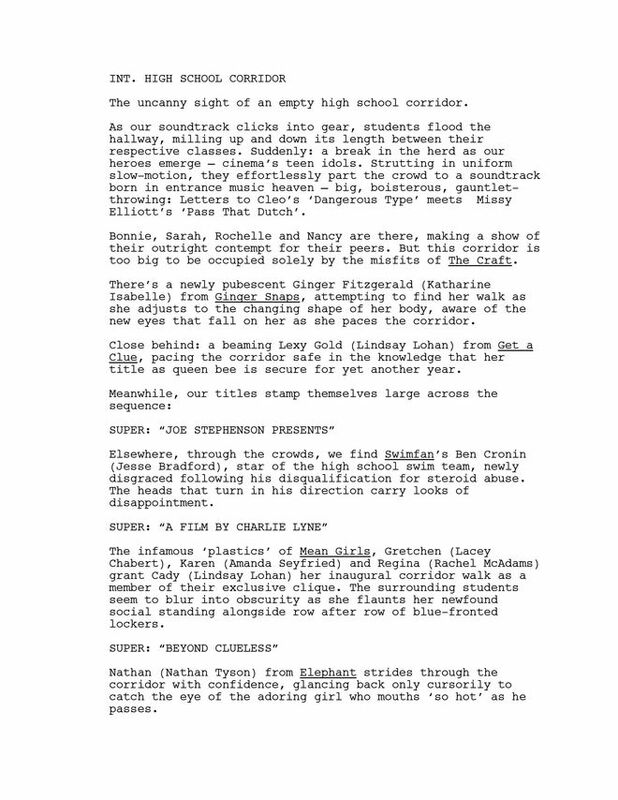 I made a thing a few years ago called Death/Hitchcock that synchronised a bunch of death scenes from Hitchcock movies to compare and contrast their pacing. Had I made it today, I'd call it a short film and submit it to festivals, but at that point I just thought of it as a neat video to stick on YouTube. How did Fairuza Balk become involved as the narrator? Charlie: I'd had her in mind as the ideal narrator since day one, but having never made a film before, I had no real concept of how to contact a Hollywood actor! In the end, after months of failed attempts to reach her agent, I discovered that Fairuza runs a bespoke candle-making company called Vestacha, and managed to get in touch with her through that. A couple of weeks later we were both sitting in a Los Angeles recording studio, and her performance was exactly what I'd dreamed it would be: a softly sardonic guide through a hyperreal universe. After a little bit of searching, we were able to work her into the title sequence too, courtesy of a brief clip from 1994's Imaginary Crimes. What do you feel differentiates the ’90s/’00s teen film from similar films from the ’80s, early ’90s, or today? Is there a difference? I feel like movies like The Breakfast Club, Heathers, or Pump Up The Volume would have fit right into Beyond Clueless. Charlie: Obviously there are certain aspects of the teen genre that will never change, just as there are aspects of being a teenager that are as true today as they were a century ago. 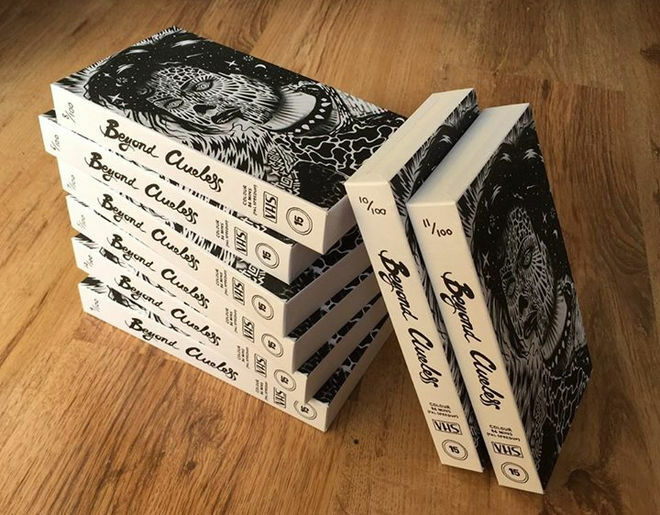 But my priority in making Beyond Clueless was crafting a world in which all the films featured could coexist – as though the girls from The Craft might at any point round a corner and come face to face with Cady from Mean Girls or Cher from Clueless. And although it was released less than a decade earlier than some of those films, to me a movie like Heathers just doesn't belong in that same space. Everything about that film – from the costumes to the performances to the cinematography – places it in a very different universe, namely the universe of Pretty in Pink and St. Elmo's Fire. And I wouldn't have it any other way: the best teen movies reflect the lives of contemporary teenagers, so they're inevitably products of their time. Is there a title sequence that sticks out in your mind from that genre? Charlie: But I'm a Cheerleader. That sequence is a perfect example of something that teen movies do incredibly well: taking a familiar piece of iconography and subverting it with a slight shift in perspective. We're used to seeing cheerleaders sexualised in teen cinema, but not in such abstract terms, and not through the eyes of a fellow cheerleader. The dayglo titles and glorious track that plays over it all – an English rewrite of an old Serge Gainsbourg song – are the icing on the cake. More generally, what are some of your favourite title sequences, whether classic or contemporary? Hattie: I'm a lover of the typographic titles in old westerns. The titles by Tom Kan for Enter the Void are awesome and always top on the inspiration list. Charlie: Gummo. There's nothing especially complex about it. It's just a load of static text superimposed over two non-sequitur scenes featuring teenage boys, but there are small variations in how each piece of text is timed and rendered – the word 'Gummo' is accompanied by an inverted cross, while Harmony Korine's credit is oversized and offset – that have seared it into my memory. Do you have a personal favourite teen movie, a gem that you’d recommend to our readers? Hattie: I freaking love teen movies. My favourites were Bring It On, Josie and The Pussycats, and The Virgin Suicides. Charlie: There are so many I could name, but I'll go with Idle Hands. Devon Sawa plays a teen stoner whose right hand becomes possessed and goes berserk. It's a great metaphor for the sheer unbridled terror of pubescent awakening, and Sawa's performance is in a league of its own. A Blu-ray release was announced while we were working on Beyond Clueless and I've never pre-ordered anything so fast in my life. 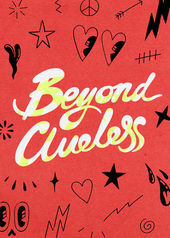 Beyond Clueless is available to watch on Netflix for a limited time and is also available on Hattie Stewart-designed, limited edition VHS at the official website.